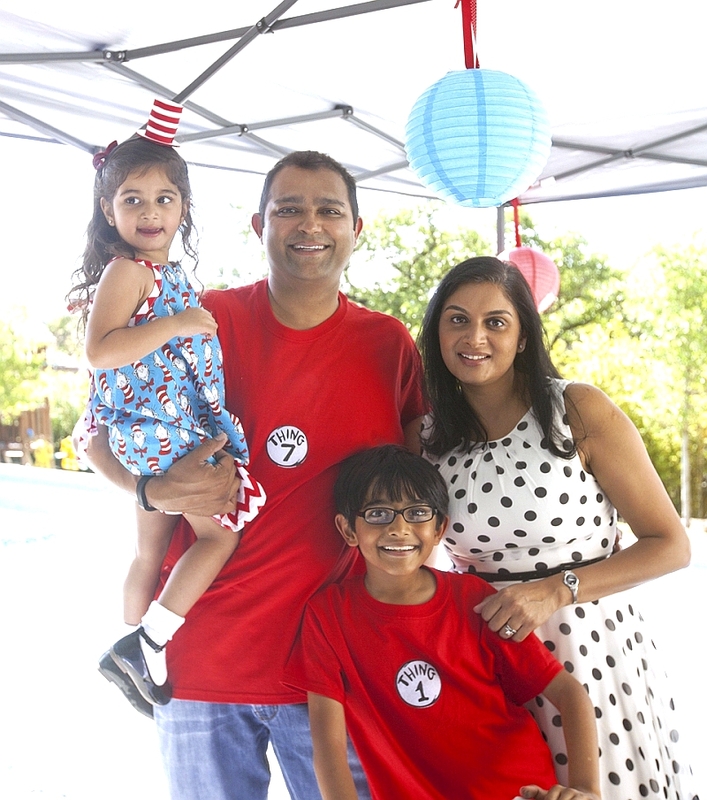 “The sun’s shining bright, it is now time to play, so we hope you’ll join Aashi, for her 3rd birthday”. 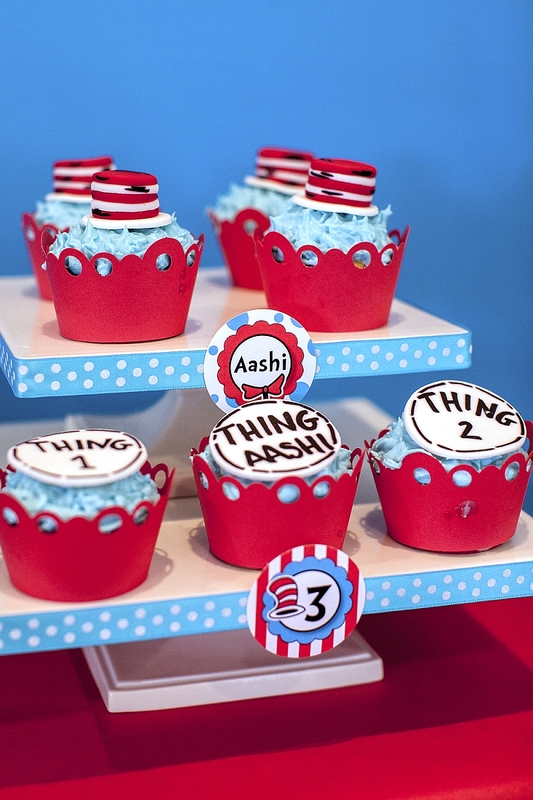 So began the birthday invitation for Aashi’s Cat in the Hat-inspired birthday, in much the same way as the book. 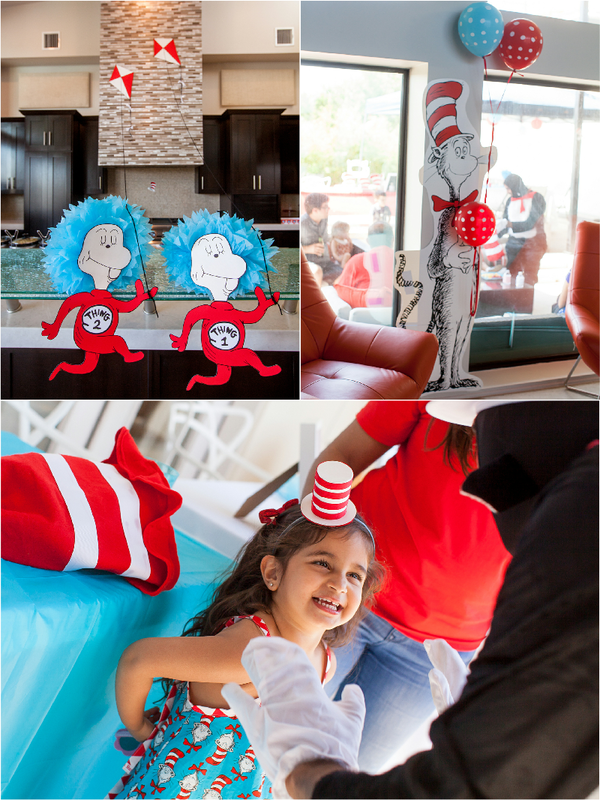 She loves Dr. Seuss (who doesn’t? 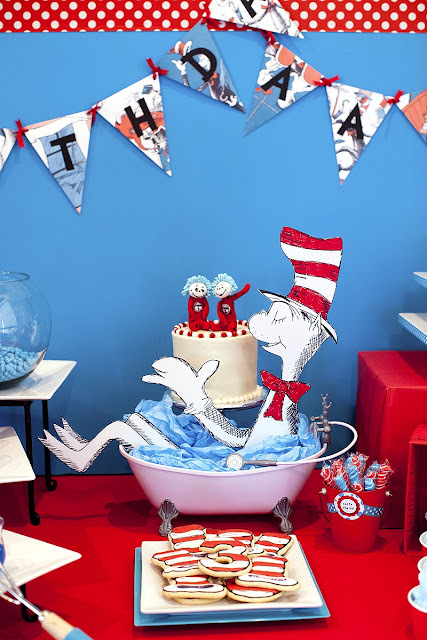 ), especially Cat in the Hat. She can’t read yet, but she has memorized the entire book, so this seemed like the perfect theme for her birthday party. 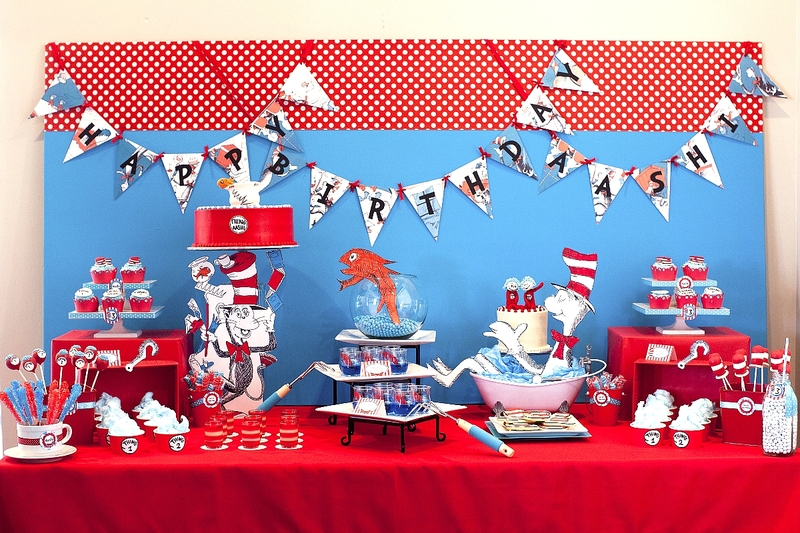 Since there’s so much great party inspiration to be found in Dr. Seuss’s other books, part of the challenge here (and the fun) was to stay focused on Cat in the Hat. 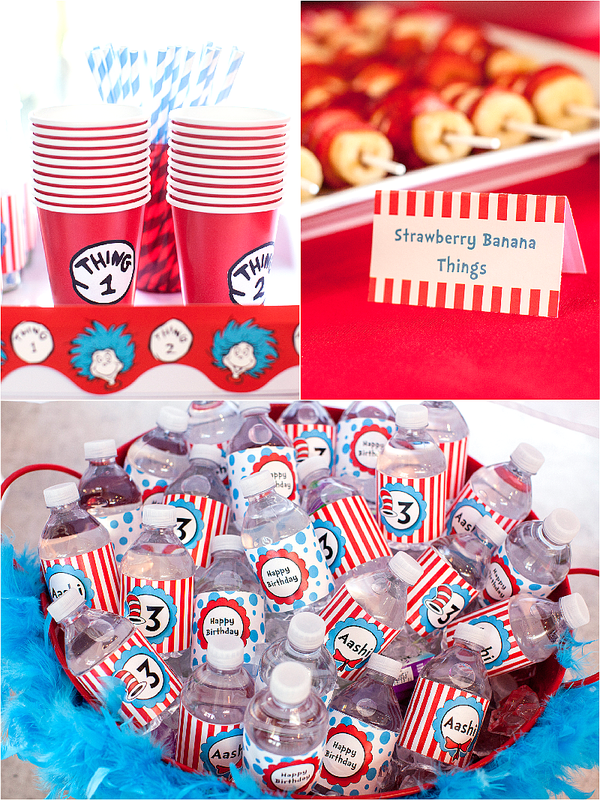 This was a very artistic party -I hand-drew the vast majority of the images for the decorations and games with Sharpie markers. 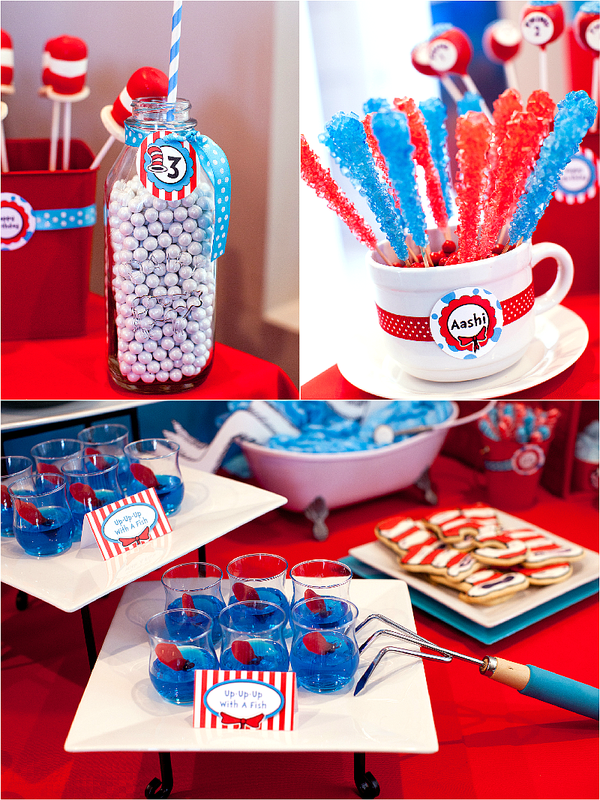 The invitation for this party was a red and white striped hat, containing a pop-out cat. The party details were written, in rhyme of course, on the back of the cat. 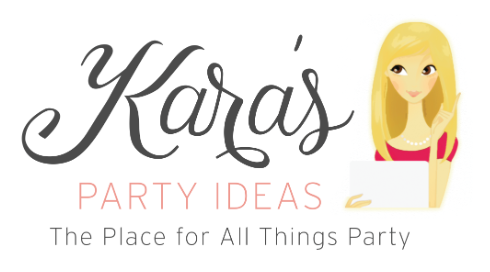 The invitations were hand-delivered and, once the guests figured out how to actually open the hat box, the reactions to the pop-out cat were priceless. 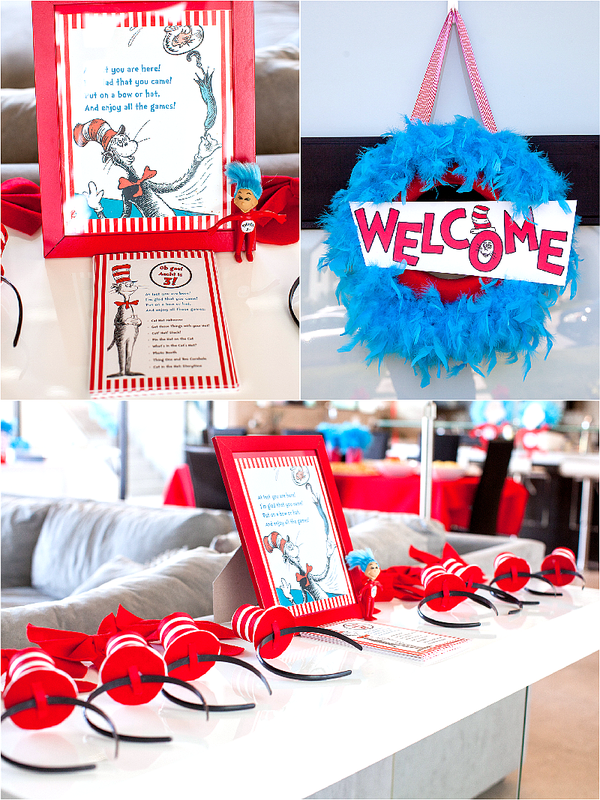 The guests were welcomed to the party by a giant cut out of a Cat in the Hat on the door and a whimsical wreath made with feather boas, reminiscent of Thing One and Thing Two hair. 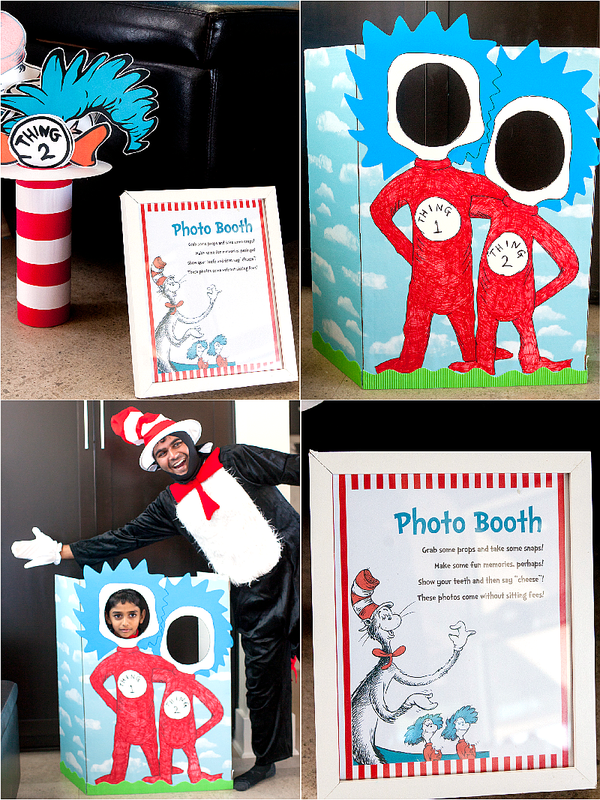 The Cat in the Hat (in costume) was also there to welcome them when they stepped in on the mat! 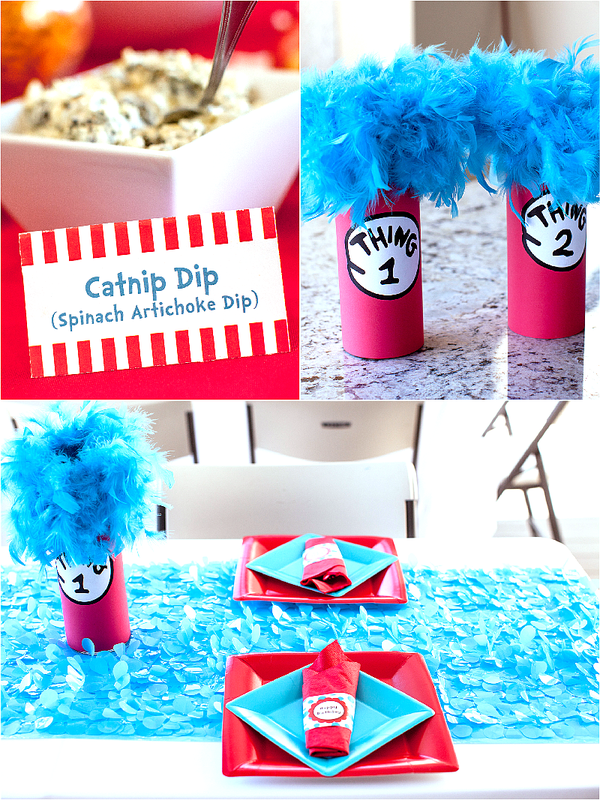 The centerpieces and fluffy table runners also played off of Thing One and Thing Two hair. I also made a giant wall mural with elements from some of our favorite scenes from the book. I hand-drew all of the pieces for the mural on poster board with Sharpie markers. 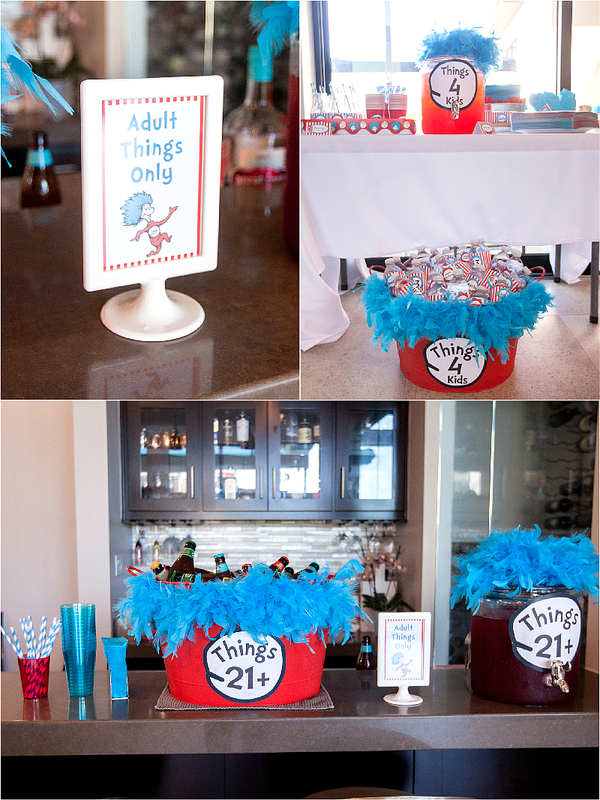 My favorite party decorations were the Thing One and Thing Two that I made, complete with kites and fluffy blue hair (made with paper pom poms) that we set on the bar top. Their kites stretched out over the kitchen and created a great 3D effect. In addition to the Cat in the Hat being in costume (from Party City), I made Thing t-shirts for the family members who were helping out with party game. The “Thing” patches on the t-shirts were also from Party City. 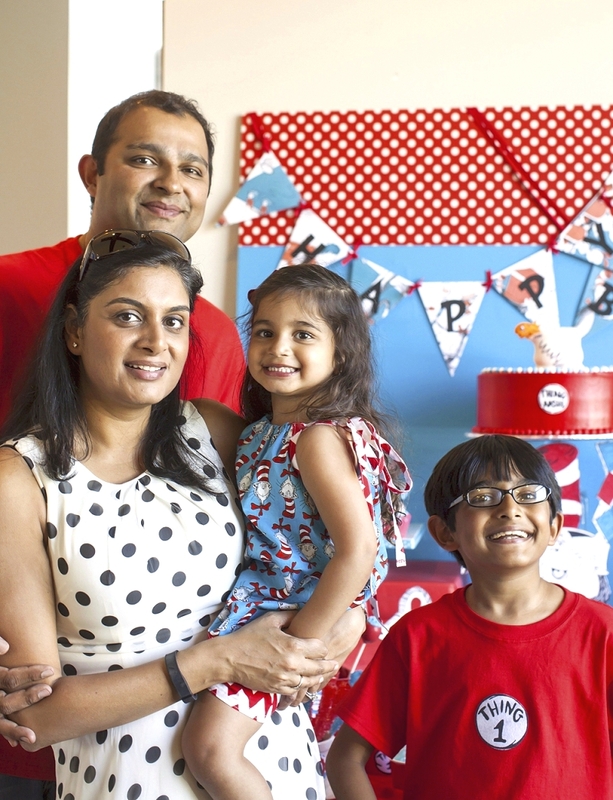 The birthday girl wore a cute Cat in the Hat pillow dress from Doodlesbabylicious. 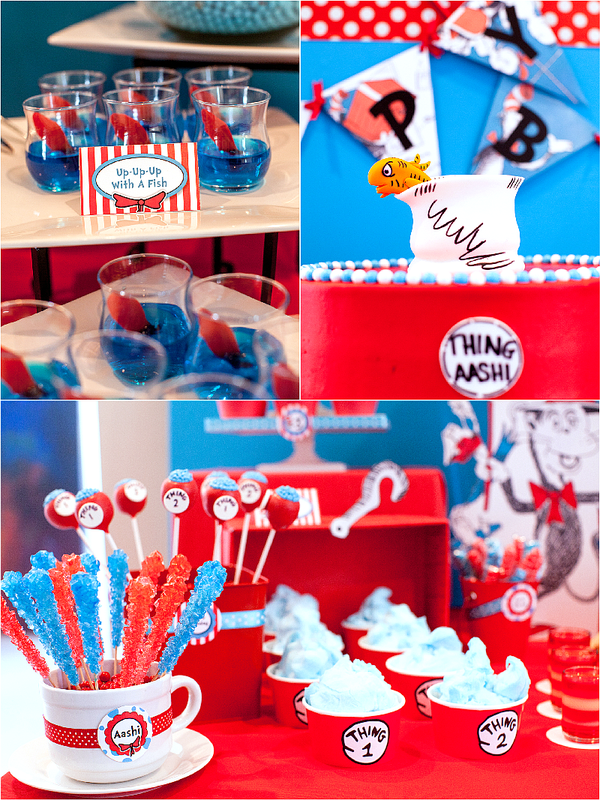 No books were harmed in the making of this dessert table: I made the banner over the dessert table from book pages that I copied onto card stock, not the actual book pages! 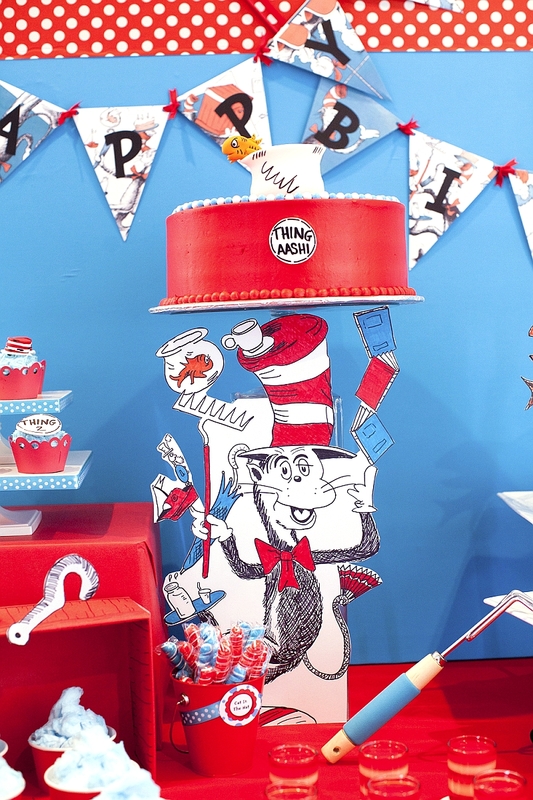 When planning this dessert table, I couldn’t shake the image of the cat balancing numerous objects (including a cake) on himself and the image of the cat eating cake in the tub (from the second book). 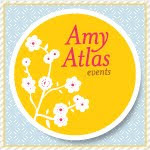 I HAD to figure out a way to make this happen! So I created my own elevated cake stands on which to balance the birthday cakes. Rather than a tiered cake, I opted for two cakes, one for each stand. The first stand was created using a plastic toy bath tub, containing a hand-drawn cat in the tub. I rigged several clear glass platters and stands together to “balance” the cake so it looks like the cat is holding it and eating from it. 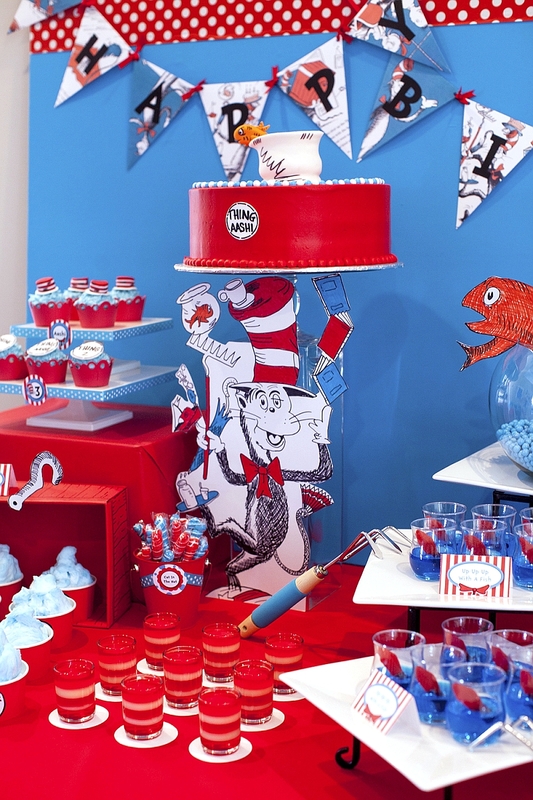 Rigging together a tall, clear glass vase and a clear glass cake stand, I managed to create the second stand tall enough to feature the hand-drawn cat balancing everything on himself—including the birthday cake on his head. 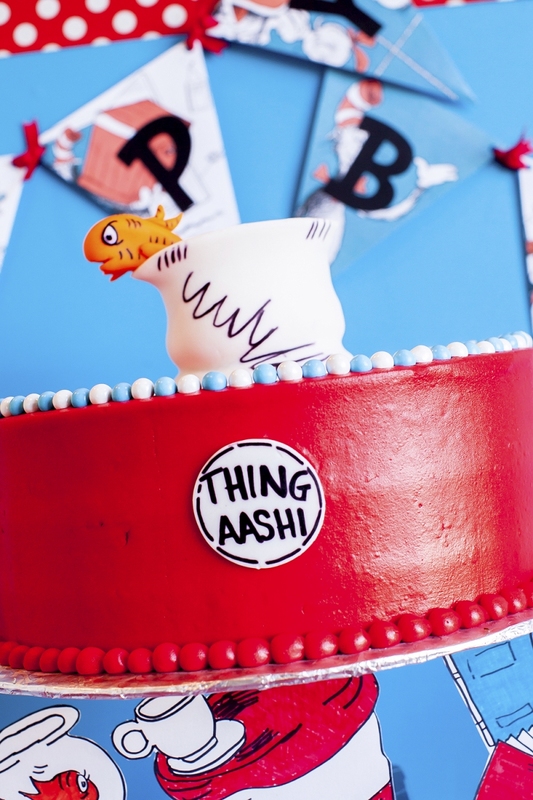 The two cakes were topped with the fish in a fish bowl and Thing One and Thing Two fondant toppers from MyArtisanBakery. In the book, the cat tells Sally and Conrad that he will play games with them, including one called “Up, up, up with a Fish”. 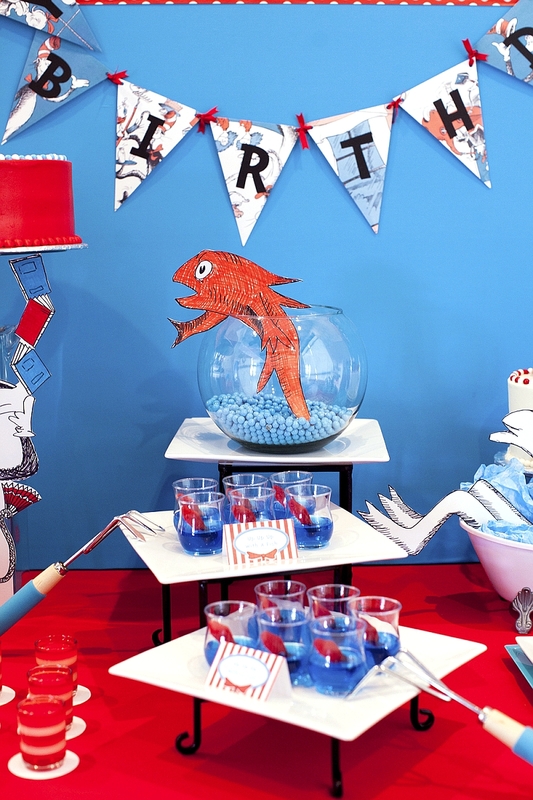 This game featured on the dessert table in the form of tiered stands, going up, containing jello fish bowls, topped with a hand-drawn fish in a bowl of sixlet. 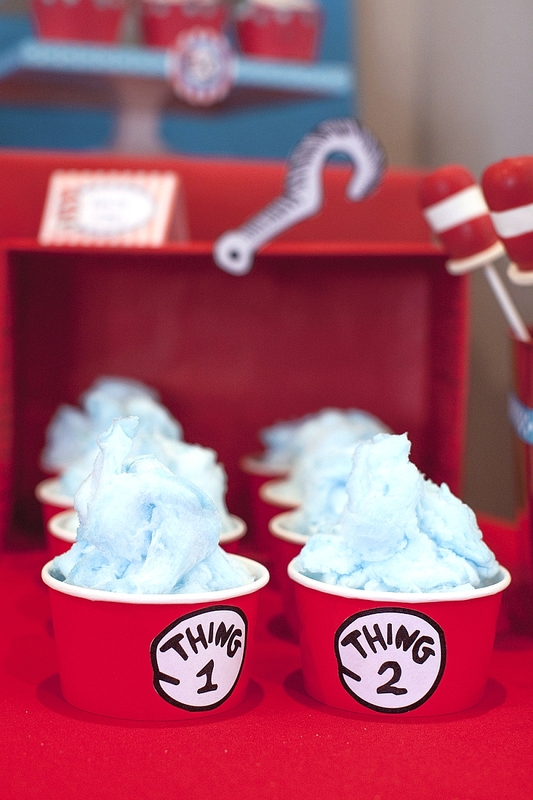 The other game the cat plays is called “Fun in a Box”, which featured in the form of Thing cotton candy cups in two red boxes, complete with a big hook on each box! 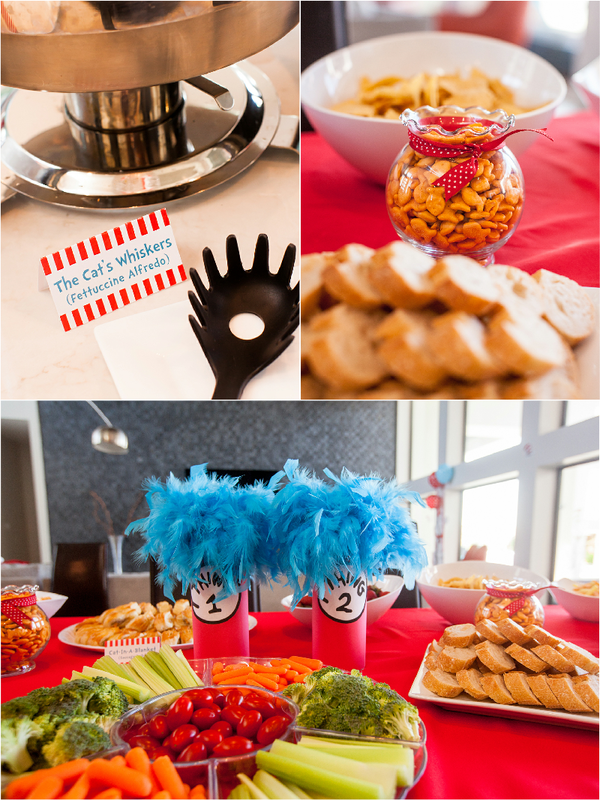 I wanted to include as many elements from the book as possible, so the table also features rakes, a tea cup containing rock candy, a milk bottle fill of candy, “hat”-inspired sugar cookies fromTreatsBuyTerri, “thing”-inspired cake pops from Fayes Cakes Pops, and “thing”-inspired cupcakes topped with fondant toppers from My Artisan Bakery. 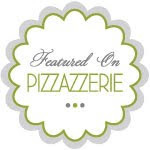 The food and drinks followed the theme. 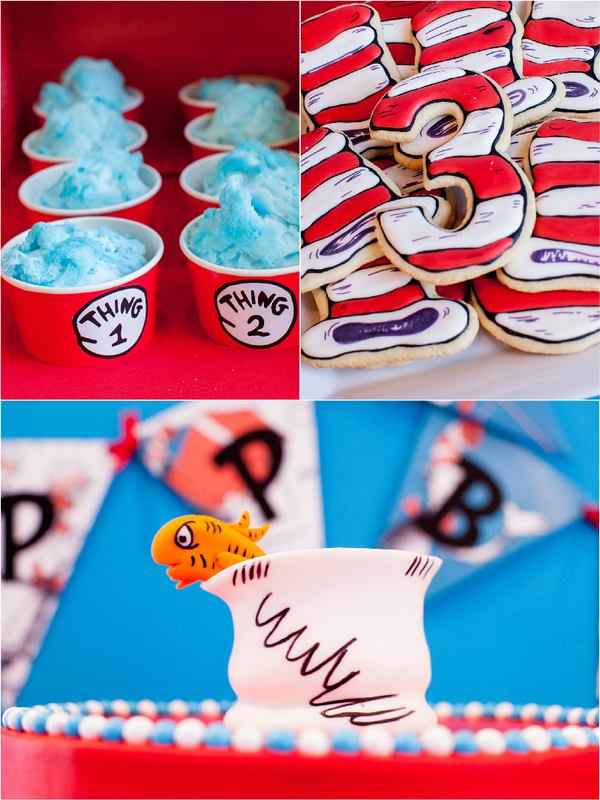 Look out for strawberry banana “Things”, Catnip Dip, Stripes-On-A-Stick, Cat in a Blanket (shaped like fish), Goldfish crackers, and the Cats’ Whiskers pasta. 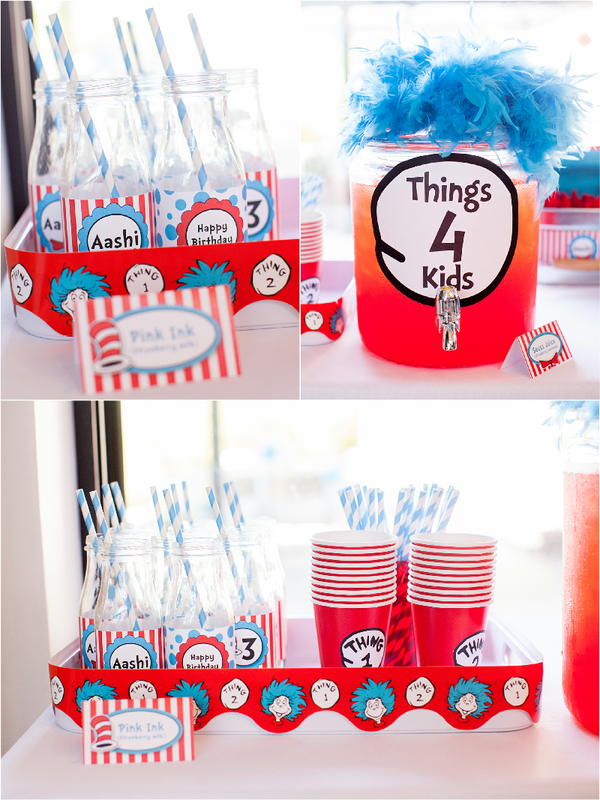 Drinks for the children (Things 4 Kids) included Pink Ink (strawberry milk), while Things 21 And Up enjoyed Adult Things (beer and wine). I had to really resist the temptation to serve Green Eggs and Ham! 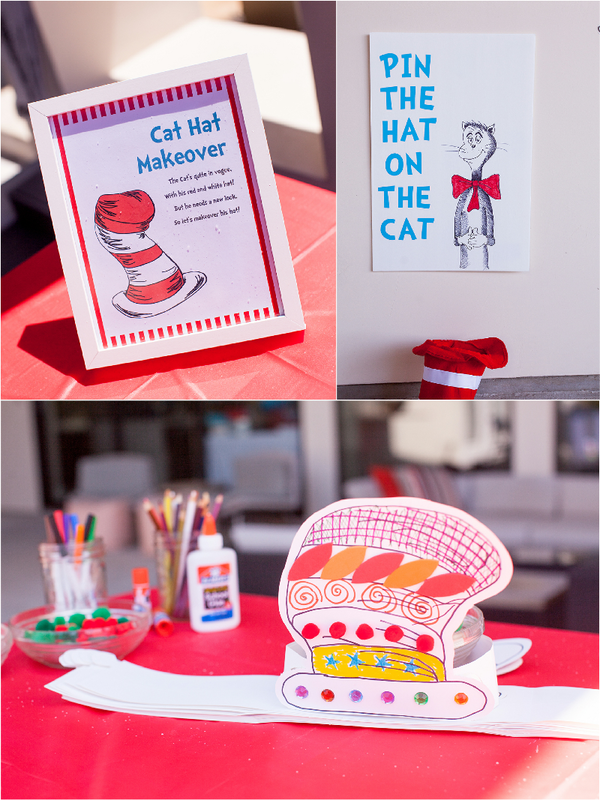 The children could design and decorate a new hat for the cat, using various craft supplies. 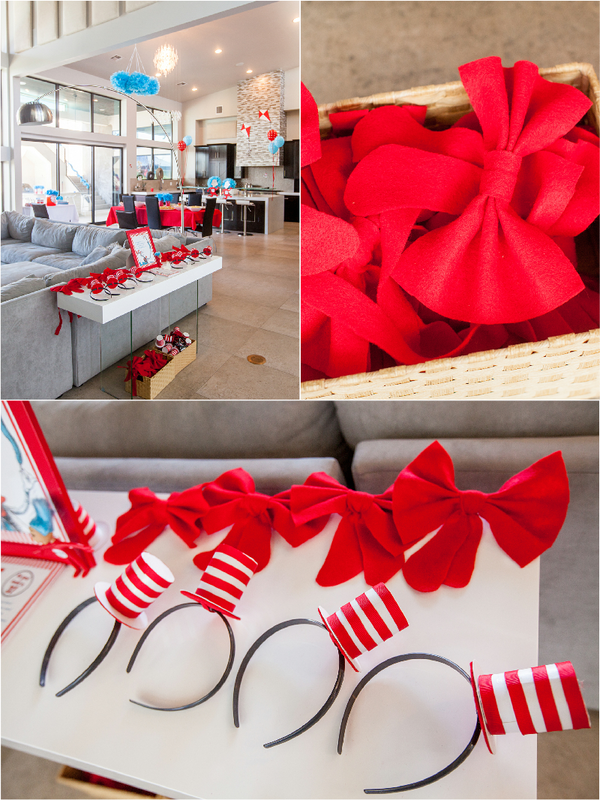 The hats were actually store-bought Cat in the Hat headband that I just flipped inside out. The kids loved this game, consisting of two blue butterfly nets and some plastic balls bearing Thing One and Thing Two patches. They had a great time throwing and catching balls in nets--almost like a mini Lacrosse game! This game was inspired by The Cat in the Hat Comes Back. I painted some stacking blocks and decorated them with letters and Cats A, B, C, D, E, F, G , H, I, and J! The children, mostly 2-3 year olds, had fun stacking them up. Simple games are great at this age. 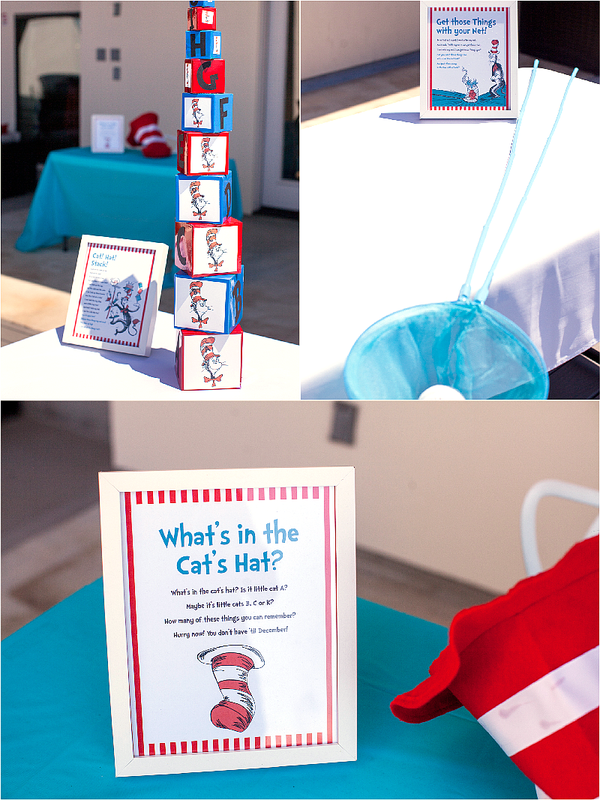 The children had to feel around various objects in the hat and guess the contents of the hat. 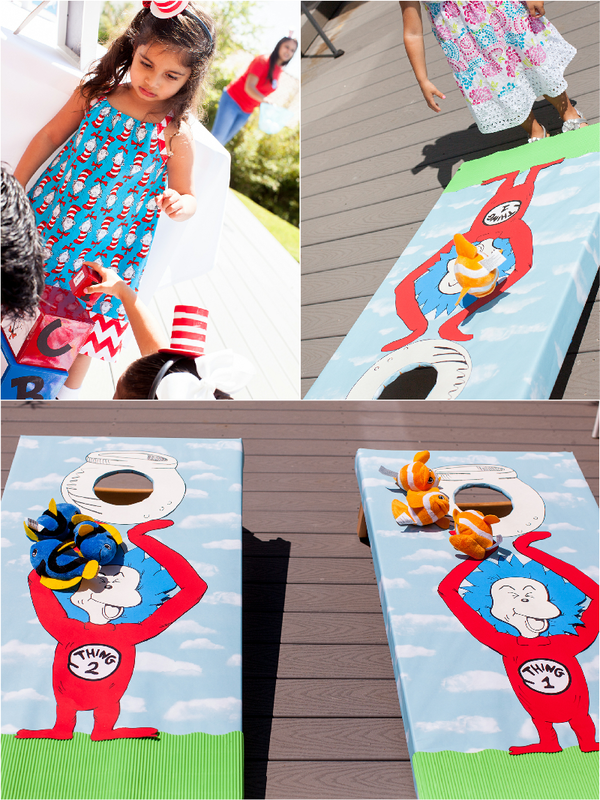 I decorated each corn hole board with hand-drawn cut outs of Thing One and Two, each holding a fish bowl on its head. The children had to try to get the fluffy fish, which we used instead of beanbags, into the fish bowls. I hand-drew the cat onto poster board, without his hat. The children had to pin store-bought hat cut outs onto the cat’s head. Instead of a blindfold, we just used a large, striped hat to put on their heads and cover their eyes. Again, I hand-drew the Things for the photo booth. 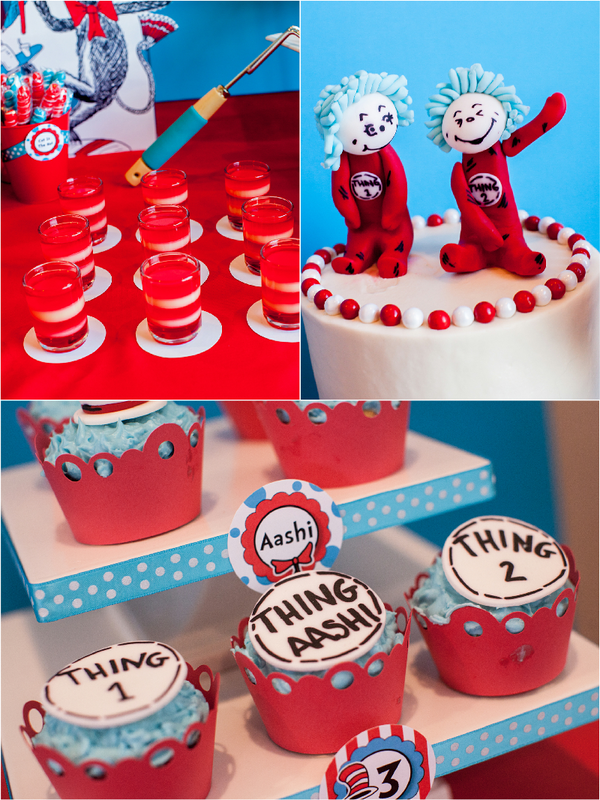 The children had great fun posing as Thing One and Thing Two. 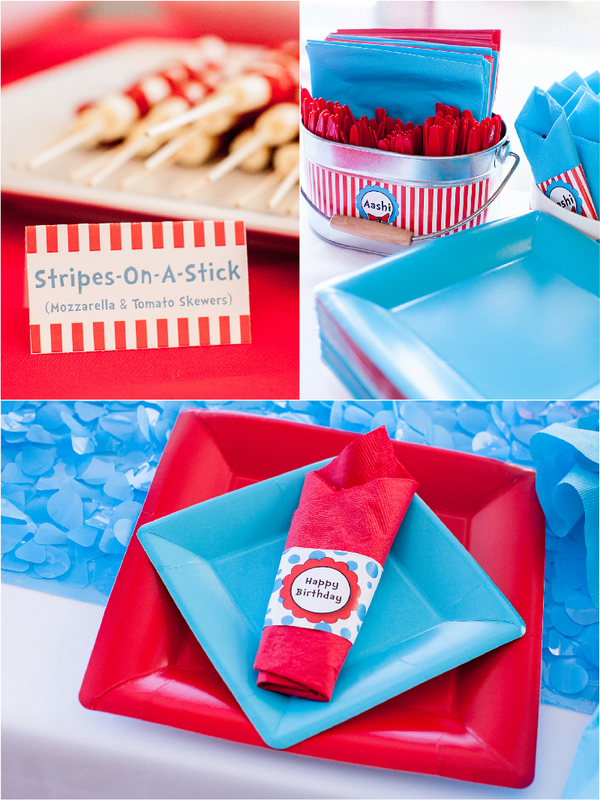 I also had various other photo props on hand. We ended the party activities by sitting down and reading the story aloud. It was a great wind down after all the fun. 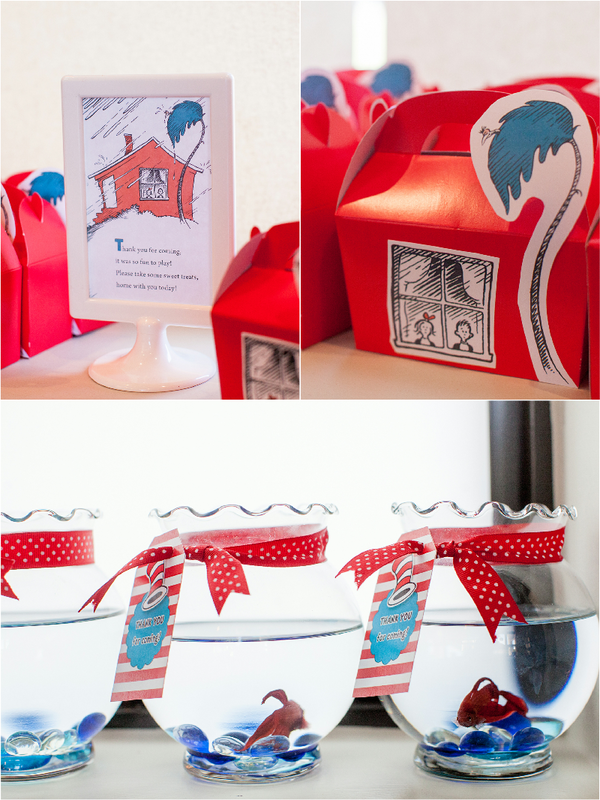 The children left the party with treats from the dessert table, in gable boxes decorated to look like Sally and Conrad’s house. 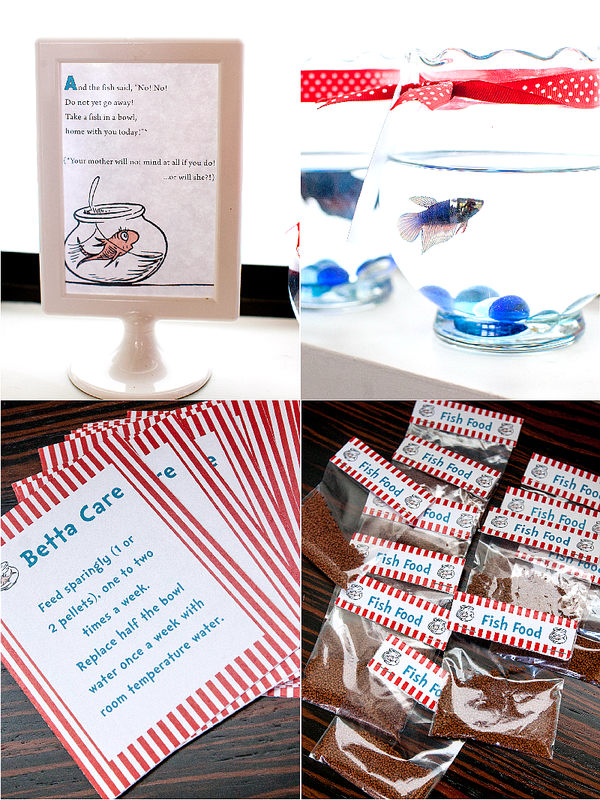 Each family also left with a new pet - a betta fish, which hopefully didn’t make the parents as grumpy as Sally and Conrad’s disagreeable pet fish.